Nearly 30 years ago, in a tiny, impoverished Ghanaian village, a young boy dreamed of becoming a professional soccer player and competing against European powerhouse Manchester United. Despite being told that he wasn't good enough, he was drafted by Seattle Sounders FC and competed against Manchester United in front of 67,000 fans. At 23 years old, Michael Tetteh had realized his childhood dream. Then, late one night, an encounter caused him to give up soccer, the single thing that had defined his entire life. In one moment, he surrendered to a new vision and stepped into the unknown. Was he crazy - or brave? 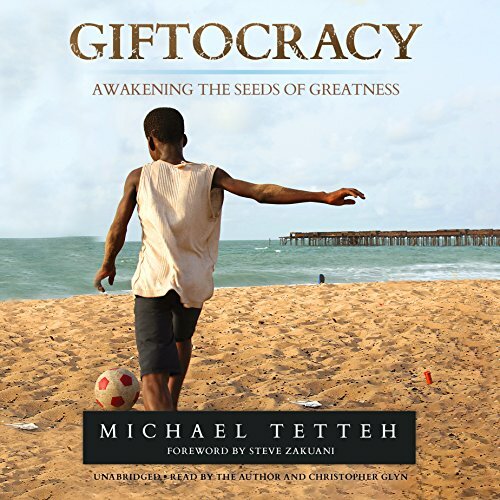 Giftocracy takes you on an inspiring journey of self-discovery with author Michael Tetteh. Powerful lessons from real-life experiences, along with thoughts from trusted influential and transformational leaders - including Myles Munroe, John C. Maxwell, and Zig Ziglar - will lead you to a new awareness. Become empowered! You can transform and transcend the opinions, conditions, and circumstances of your life. Discover the gift trapped within you, and share it with the world. ©2016 Michael Tetteh (P)2016 Made for Success, Inc.